Rainwell Waterseat - Enter Energy & Water. Schools and Kinders, what a way to teach kids how to be waterwise? 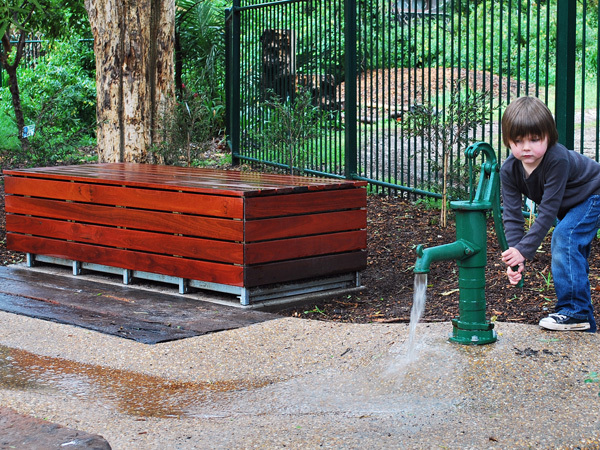 Children can experience the pleasure of rainwater and discover the multitude of benefits it provides. Rainwell Waterplay begins with rainwater falling on the buildings roof and diverting from the downpipe to the Rainwell Waterseat. A classic cast iron hand pump and beautifully landscaped water-run and pond inspires curious minds. Brilliant! A rainwater tank in an outdoor seat. The Rainwell Waterseat provides outdoor seating and rainwater storage for gardens, swimming pools and hand water pumps. Sustainably managed Australian Jarrah is crafted into the Rainwell Watersea's construction; creating a natural, unobtrusive design to compliment outdoor entertaining areas and garden settings. 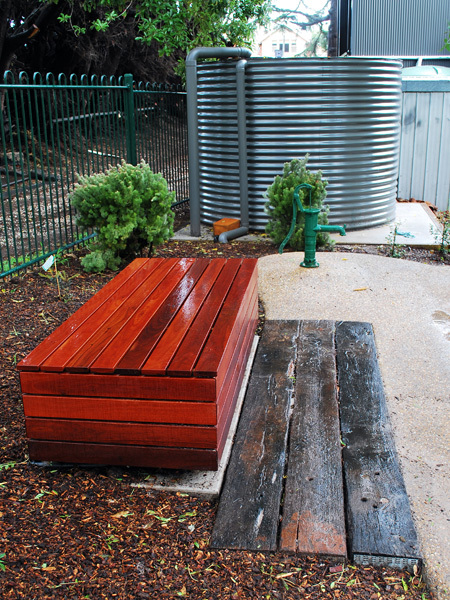 Jarrah's magnificently rich coloured grain, durability and smooth finish is ideal for outdoor seating and concealment of the rainwater tank. 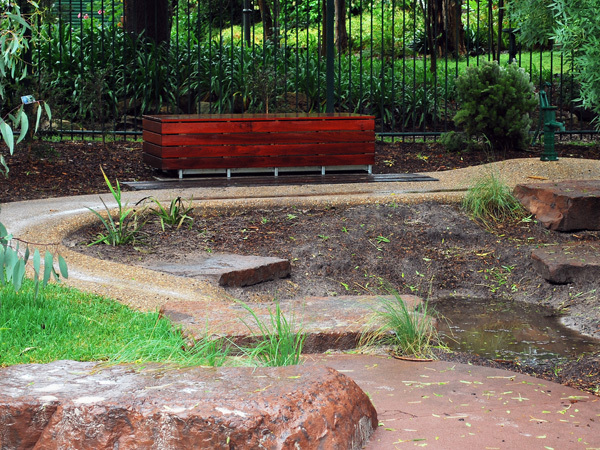 UV and moisture protective oils (protective finish PF) are used to enhance the Jarrah's appearance and preservation. The rainwater tank is constructed from resilient galvanised steel and protected with an anti-corrosive, waterproof membrane which is suitable for potable water and guaranteed for 10 years. Integral to the Rainwell Waterseat's operation is the Rainwell RFD which provides rainwater filtering and overflow function at the downpipe. 400 litre, w1800mm x d750mm x h475mm. 600 litre, w2700mm x d750mm x h475mm. AIS are controls to regulate harvested rainwater and stormwater runoff to sustain gardens more naturally. When the Rainwell Waterseat's tank is full, the AIS can divert rainwater from stormwater runoff to natural water storage in garden soil - more closely mimicking nature. Rainfall conditions are ideal times for garden irrigation as rainwater has a better chance to absorb into the soil, which can hold approx. 1/3 of its volume. Moisture deep in the soil is retained longer and will attract plant roots downward, which will sustain the plant through extended dry periods. Stored rainwater can be released before the next rainfall to replenish the soil and allow time for plants to absorb the moisture; making space in both the tank and soil to capture the next rainfall. 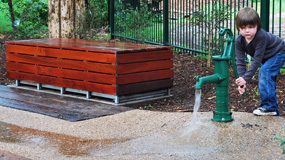 The Rainwell Waterseat is available with single or dual AIS units. The Dual AIS can support 2 garden areas independently which enables rainwater to be used more efficiently. NOTE ALL PRICES GIVEN ARE FOR STAINED PROTECTIVE FINISHED TIMBER, FOR CHEAPER UNSTAINED UNPROCTECTED FINISH CONTACT ENTER. Rainwell Waterseat Jarrah Top & Front 400 litre single AIS & PF.Jarrah Top & Front 600 litre single AIS & PF.Jarrah Top & Front 400 litre Duel AIS & PF.Jarrah Top & Front 600 litre Duel AIS & PF.Jarrah Top,Front,Side & Access Door 400 litre single AIS & PF.Jarrah Top,Front,Side & Access Door 600 litre single AIS & PF.Jarrah Top,Front,Side & Access Door 400 litre duel AIS & PF.Jarrah Top,Front,Side & Access Door 600 litre duel AIS & PF.Jarrah Top,Front,Back,Side & Access Door 400 litre single AIS & PF.Jarrah Top,Front,Back,Side & Access Door 600 litre single AIS & PF.Jarrah Top,Front,Back,Side & Access Door 400 litre duel AIS & PF.Jarrah Top,Front,Back,Side & Access Door 600 litre duel AIS & PF.